The time series shows Amazon.com's net revenue from 2014 to 2018, broken down by department. 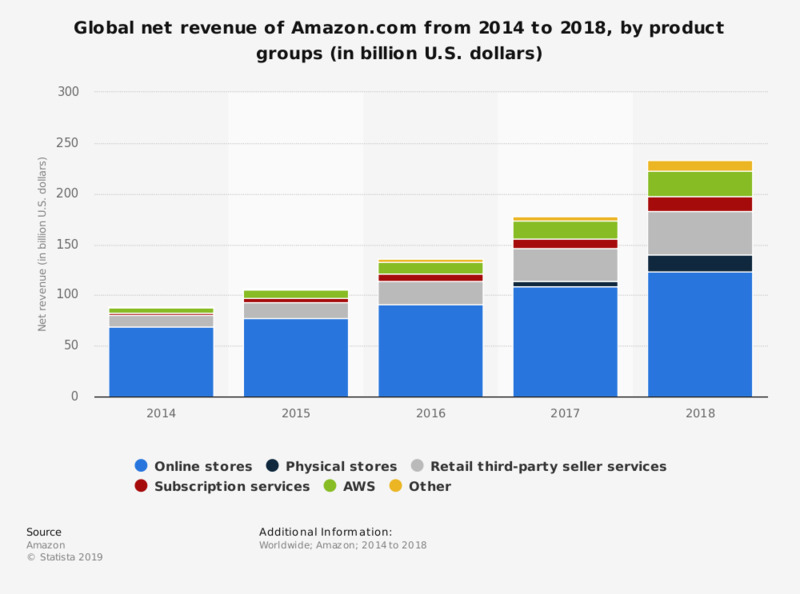 In 2018, Amazon.com's net revenue from subscription services segment amounted to 122.99 billion U.S. dollars. Subscription services include Amazon Prime, which is estimated to have 95 million members in the United States as of June 2018. The AWS category generated 25.66 billion U.S. dollars in annual sales. Online stores: Includes product sales and digital media content where we record revenue gross. We leverage our retail infrastructure to offer a wide selection of consumable and durable goods that includes media products available in both a physical and digital format, such as books, music, videos, games, and software. These product sales include digital products sold on a transactional basis. Digital product subscriptions that provide unlimited viewing or usage rights are included in Subscription services. Physical stores: Includes product sales where our customers physically select items in a store. Retail third-party seller services: Includes commissions, related fulfillment and shipping fees, and other third-party seller services. Subscription services: Includes annual and monthly fees associated with Amazon Prime membership, as well as audiobook, e-book, digital video, digital music, and other non-AWS subscription services. Other: Includes sales not otherwise included above, such as certain advertising services and our co-branded credit card agreements.